In Canada, a recent proposal by the Quebec government to implement a “Charter of Values” has generated considerable controversy. The basic premise of the charter is that the state should be neutral and, as such, officers of the state should not be adorned with anything that would betray their specific beliefs. If you put a big “X” over the image to the right, you get the idea. Now, there are several reasons why this is problematic, and political philosopher and Quebecker Charles Taylor recently gave a good interview on why this is. You can view it here on CBC. Now, whether or not this new legislation goes through, it begs the question of whether the state is neutral and whether this is even a goal that can be stated in neutral terms. That is, neutrality itself may very well be the outcome of a particular political point of view. Taylor starts out by making a nice point, that requiring people to stop wearing outward symbols of faith immediately makes a judgment about faith being something that one holds in their inner person. Which is very much okay for some faiths (i.e. Christianity) but not so for others where certain practices are necessary for belief. For my part, I would like to see the broader conversation get going in Canada. To do so, we would first need to acknowledge that, because the goal of state neutrality requires conformance to practices that leave our beliefs at home, this is already making a substantive judgment about beliefs, and how and why they matter. We would need to acknowledge that the state is not neutral. Maybe we should stop talking about the “neutrality of the state”, but in any case what is being sought here (other than votes, I mean…) is not so much a “neutral state” as an “État laïque” (there is no direct translation that I know of, but the closest thing might be a “secular state”). “Laïcité” (or secularism) is the key word in this debate, not neutrality. Indeed, the Parti québécois originally announced a “Charte de la laïcité”, not a “Charte des valeurs” (a bad change of name and spirit, in my opinion). Put (too) simply, an État laïque is a state that is independent from any religion (and, of course, different degrees of independence are possible and there are heated debates inside the secularist movement). Different religions having different practices and systems of belief, some religions might indeed feel the weight of an État laïque more than others, so it is certainly possible to argue that an État laïque is not completely neutral or impartial – but that is not really the point (even though the word “neutral” is used). The question is not whether the PQ’s project is discriminatory or not, but what kinds of discrimination are tolerable and what kinds are not. The political philosophy underpinning “la laïcité” is not liberalism, but republicanism, a more collectivist philosophy, and, of course, important cultural differences in the interpretation of what secularism means are at play here: the legacy of French culture and Catholicism’s collectivism is obviously much stronger in Quebec that in the rest of Canada. Here is an imaginary illustration of what these differences could mean in practice: the “neutrality” of the state could mean that no religious prayer at all is performed in Parliament before MPs start their deliberations or that multiple religious prayers from multiple religions are performed (a different one each day, perhaps). Of course, neither option is a 100% neutral or impartial, but one is laïque and the other is not. Now, I am not saying that this project of charter cannot or should not be criticised (personally, I hope that it will be modified in several ways). First, from a strict laïque perspective, it is incoherent and does not go far enough: the crucifix should not be allowed to stay on the wall in Parliament; (catholic) religious prayers should be forbidden in municipal councils (just like in Quebec’s Parliament); fiscal advantages given to religious organisations (mostly the Catholic Church) should be re-evaluated; etc. 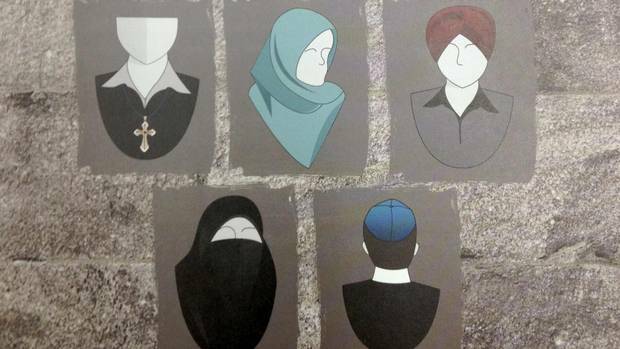 Second, from a less strict laïque perspective (in Quebec, there is something called “open laïcité”), from a liberal perspective or simply from a “pragmatic” point of view, to forbid all employees of the state to wear ostentatious religious symbols might be considered non necessary or simply wrong. But it seems to me that to say that no charter could ever make the state “really” neutral or that neutrality is an unreachable illusion is either a weak critique of the PQ’s project (what politically important thing is “really” neutral?) or beside the point. P.S. : Good blog, by the way! Hi Fred! Great to hear from you, are you in Ottawa these days or back to Quebec? I think your point about the differences of republican secularism add an important corrective element. There is certainly a different trajectory that emerges out of the strong corporatist movement of the early 20th century in Quebec. And also, on Taylor, I agree. His odd comparison weakened his point. And I too could not quite suss out where encountering the “force of the state” should really be said to lie. Taylor seems to want it to be hinged on something about our bodies (i.e. police who imprison us should be neutral) but there are a lot of other ways to be confronted by the force of the state (i.e. in a refugee or visa hearing). I would be interested to hear more from you on this – particularly because it seems like the appeal to Etat Laique (sorry, english only keyboard here) also seems to draw out a different kind of distinction; one where certain symbols are treated as historical artifacts, like the crucifix, even though they clearly have on-going significance. To me, this is also a way of trying to be ‘post-metaphysical’ even if it is not in a liberal tradition. And on this point, the liberal tradition has its own ways of making certain things, or the practices of others, historical artifacts through discourse around what is modern.